The President of the GA, of course, believes that the United Nations must provide a forum where all views of Members States can be expressed, even those views that are considered controversial. That said, he is disappointed that the controversy has become a distraction from the bigger goal of finding justice and sovereignty for the Palestinian People. It is unfortunate that the attention has focused on the President of Iran rather than on this difficult process of bringing peace and justice to peoples of the region. After Yeves read out this statement, Inner City Press followed up, asking who d'Escoto was criticizing for focusing on Ahmadinejad: the press or Ban Ki-moon? It was that Yeves made the parenthetical statement about it being a "theatrical production." 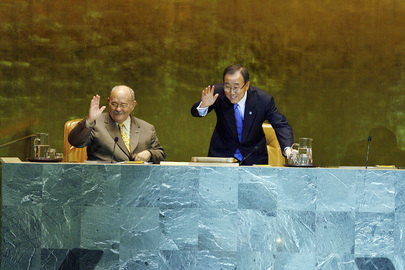 In fact, Monday in UN headquarters it was more like a screening of a home movie. Ban's Spokesperson's Office cancelled the normal Q&A noon briefing, and instead used the briefing room to show a broadcast, at first without sound and throughout without any possibility to ask questions from UN Headquarters, of Ban and Navi Pillay speaking in Geneva, denounced Ahmadinejad. Ban went further and called for "discipline" on NGOs. Since then, several have been thrown out from the Review Conference. Footnote: D'Escoto's good buddy Evo Morales of Bolivia was at the UN on Wednesday for the new Madre Tierra / Mother Earth Day. One reporter protested that there was already one (or two) UN accepted Earth Days. Another called the nomenclature sexist, and said that Germany in the General Assembly spoke of Father Earth.